KitchenAid is a company that produces high quality and durable kitchen appliances. Their known for their versatility, applying the same concepts over a range of products. 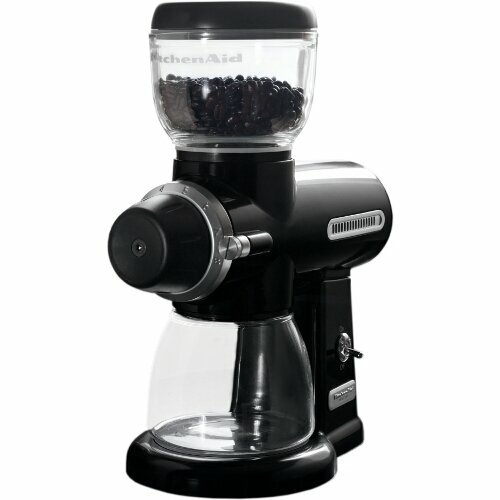 The KitchenAid Pro Line Series Burr Coffee Mill is a good example of the high standards they stand for. It’s a quality coffee grinder, without a doubt, but it’s not the perfect grinder. It does a fine grind for french press and drip coffee makers, but is not the best in preparing an adequate espresso grind. For all espresso lovers, we recommend using the Rancilio Rocky, which will produce the perfect grounds for a nice, rich espresso. You can pair it up with the Rancilio Silvia espresso machine to get the entire experience, or you can use it with any other espresso machine. Again, as mentioned above, it’s not necessarily the perfect grinder if you prefer espresso, but it does an awesome job if you have a drip coffee maker or french press. It has two flat, precision cutting burrs which will make sure your grinds are always at the same consistency. They are built to reduce heating of the grounds from friction as much as possible. This way, the grounds will maintain the flavor and you will enjoy the same quality cup of coffee you always do, provided your coffee maker is holding its end of the deal. The coffee grinder is made in the USA, which says a lot about the quality of construction and durability. It made almost entirely of metal and if you take care of it it will probably last a long while. The burrs and glass components of the coffee grinder are easily replaceable. Cleaning this grinder is fairly easy, but what we notices, and most users complained about, is that the glass bin is so easily breakable. When you try to remove it you must pay some attention. In case you break it, don’t worry, you can find replacements or you can use a jar about 3.5″ tall with 3″ diameter. Besides the fact that it’s easy to clean, it’s designed to move the coffee and then the grounds as simple and easy as possible. This way, they achieved to release a grinder that is not only extremely easy to clean, but also doesn’t create a lot of mess and doesn’t plug up like other grinders do. Overall we liked the KitchenAid Coffee Mill. It’s made to last and produces a good grind. If you are a perfectionist, then you might want to look at more professional grinders, but this one will get the job done just right, and considering the fact that that it will last maybe a lifetime, buying it will turn out to be a good value for money decision. Next post: What’s the Best Instant Coffee? Follow Coffee Drinker's board Espresso Machines on Pinterest. CoffeeDrinker.net is a participant in the Amazon Services LLC Associates Program, an affiliate advertising program designed to provide a means for sites to earn advertising fees by advertising and linking to Amazon.com. Certain content that appears on this website comes from Amazon.com. This content is provided 'as is' and is subject to change or removal at any time without prior notice.